We have a dedicated in-house staff which operates out of a 19,000 square foot facility. Mamais directly employs a workforce of over 150 full-time employees that enable us to control the quality, timeliness and cost-effectiveness of our projects. We specialize in high-end interior alterations and renovations; offering a well-organized, well-equipped, and highly professional approach to our projects. Additionally, we have a staff of highly experienced woodworkers who focus on all types of custom fabrication; ranging from basic shelving to sophisticated custom cabinetry, and from simple construction to complicated details with fine finishes. Our company has built a reputation on proven performance and we remain fully committed to providing our customers with the very best in Quality & Service. In 1965, 21-year-old Louie Mamais and his brothers left their home in Greece for the promise of the American dream. Already in construction by trade, they spent the first three years refining their skills as carpenters and millworkers until deciding to establish their own company in 1968, known today as Mamais Construction. From the start, the Mamais approach to business was to provide exceptional service coupled with quality and value to the customer. This concept resonated with clients and Mamais Construction quickly developed a devoted customer base which lasts to this day. The company grew steadily during the next three decades, while building on its reputation for quality work and professional service. In 1994, Louie and his brothers stepped down and the company transitioned to the second generation of the Mamais family. His son Peter Mamais assumed the role as Vice President and daughter Voula Mamais moved into the position of President. 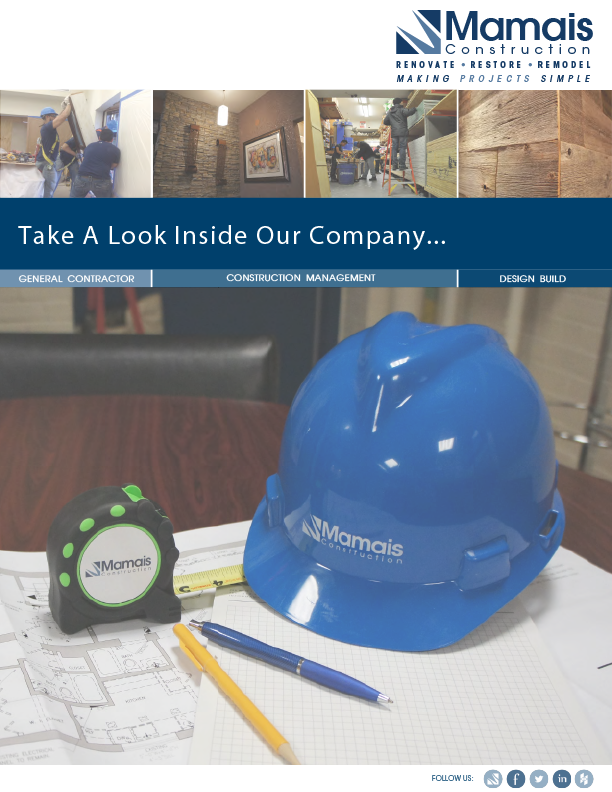 Under their leadership Mamais Construction has enjoyed great success and growth while building on the company’s reputation for quality and service. Over 80% of our annual work comes from existing clients with the balance attributing to our passion for growth. In almost 50 years of operation, Mamais Construction has grown from a small one room operation with one truck to an organization of more than 150 full-time employees with a fleet of over 30 commercial trucks. Today, we continue to grow by adhering to the tradition of our founders which is providing customers with Superior Construction Services. We thank our founders and stay committed to the ideals and philosophies upon which they established. Relationships are the most important thing we build as a company. Over the years, we have forged many long lasting relationships with our customers due to our attention to detail, and to the extra service we always provide. It’s our goal to continue to grow and prosper by serving the needs of our customers and to enhance our reputation by providing solutions on all of our projects, with the utmost in professionalism and efficiency. The trust and confidence we build with our customers is one of our most important measures of our success, and this is a factor that stems from our diverse and committed workforce. Feel free to contact us if you have any questions or to discuss your project needs. Our quality control plan is a standard plan we use for executing our contracts. We implement this plan and it is carried out by our management team to ensure our commitment to quality. We define a specific methodology and approach on all projects, which is followed during the performance of our workforce to meet our expected standard for quality. A self-performing general contractor establishes project goals and expectations early on and keeps the team focused and on task. Additionally, when general contractors are able to use their own crews and equipment, it is easier to control the schedule. This flexibility and control is especially important when there is a demand for fast-track projects to meet required timelines. Another advantage of self-performed contracting is better management of owner-initiated design changes. When a general contractor is self-performing, these orders are given to them directly and executed by them allowing the change to be made quicker and most cost-efficiently. If a contractor is self-performing a project then it is much easier to keep a grasp on the daily clean-up and safety requirements. Typically, the area remains cleaner and safer to work because the general contractor controls the entire job site with their own crews. Contractors who regularly self-perform must have a strong infrastructure of craftsmen and project managers who are successful working as a team. Mamais Superintendents average 15 years’ experience with the company, with most of them having been tradesmen themselves. It is imperative that the general contractor has an experienced staff with an excellent track record. When you work with a contractor who offers this service, you know they have spent years developing the infrastructure and number of professionals needed to carryout self-performed projects.